l’ASV TV a développé un logiciel permettant de programmer un clavier midi et autorisant ainsi son utilisation dans le logiciel de vidéo VMIX. 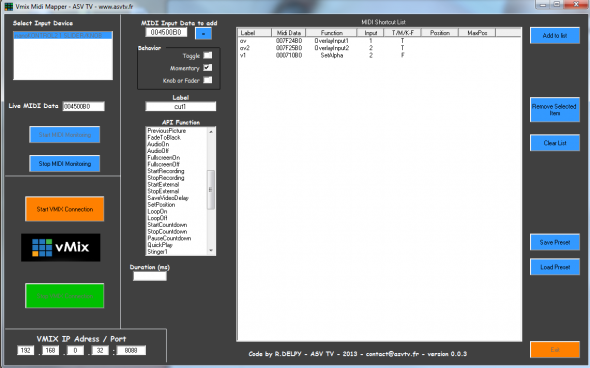 ASV TV has developed a software to map a midi keyboard and thus allowing its use in video software VMIX. VMIX Midi Mapper is able to send API Function unsing a MIDI device to the wonderful program nammed « VMIX ». Be careful, antivus software doesn’t like vMixMidiMapper ! Disable it if possible. Run the setup.exe as administrator otherwise some .dll will miss. – If it is a toogle button, just push the button and click on the « = » button. – Do same method for other midi inputs. No shortcuts number limitation. This software was developped with a NanoKontrol2 Midi Keyboard. So, if you’re using another type of device, some values may change. The developper is not responsible of possible problems due to the excecution of this software. Vmix midi mapper is great, thank you! Is it possible you to update it to include all the new shortcuts available in vmix 12. There is new features, api, which would be nice to map into midi devices. Type mismatch Une erreur d’installation inattendue s’est produite! This is a new build Win 8 machine with .NET installed and nothing more. Are there some C library I need to install?? How to download new version ? I don’t see any working link . Are you still working on this / or making it available?